I've had quite a few questions on how I created this 4" x 4" standing desk calendar, so I thought I would address them here. It was created using plain white chipboard coasters as the covers. 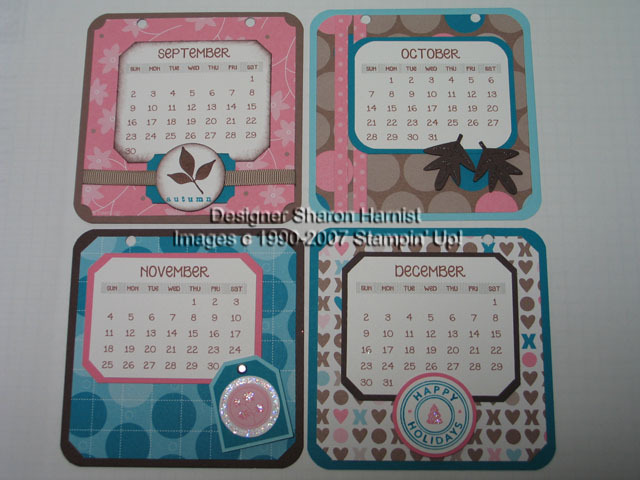 Mine were given to me by my sweet friend, TexasStampin, (thanks again, sweetie!). 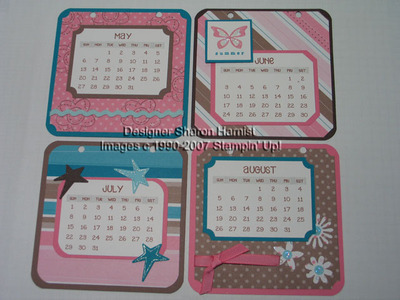 Check out this thread for more information or StarLitStudio carries them, too. You might also be able to get a few of these from a nice waiter at your favorite "red pepper" restaurant! 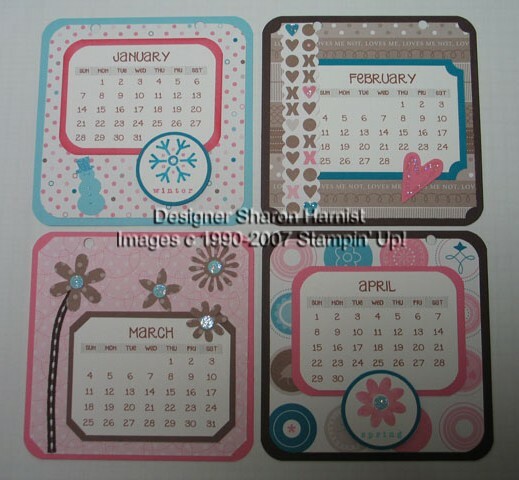 The calendar template I used was downloaded from SplitcoastStampers.com from a sweet gal, Suzyq01, who shared her template and you can find it HERE. I just changed the font and color to suit my project. The rings holding it together at the top are 3/4" binder rings found at an office supply store. 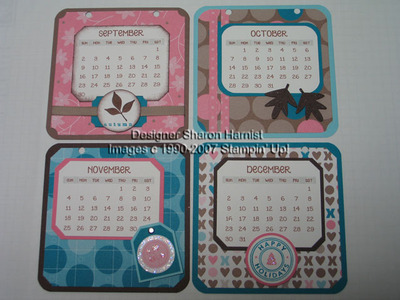 I used my Crop-A-Dile to punch the holes thru all the pages (StarLitStudio also carries these) -- fabulous product! I used Stampin' Up's Anywhere Glue Stick to glue the designer paper (SU's Loves Me, available in the Winter Mini catalog until Feb 28) onto the coasters. 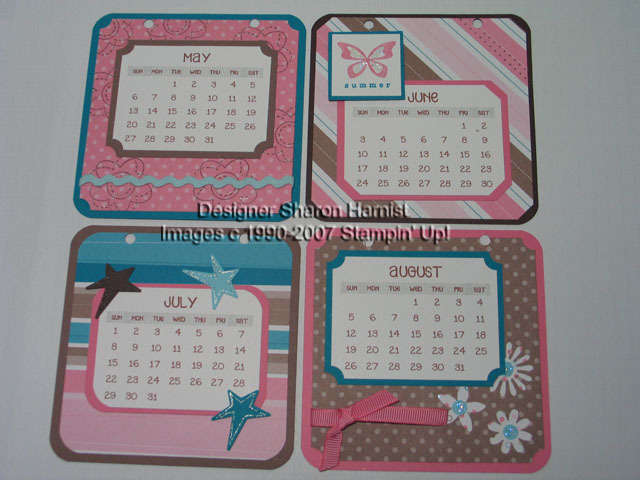 The inside pages are cardstock cut to 4" x 4" and the corners rounded to match the coasters. 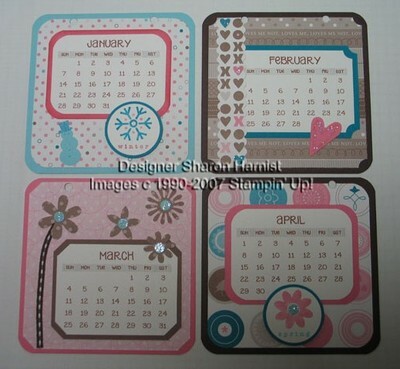 Slap your calendars on and embellish away! 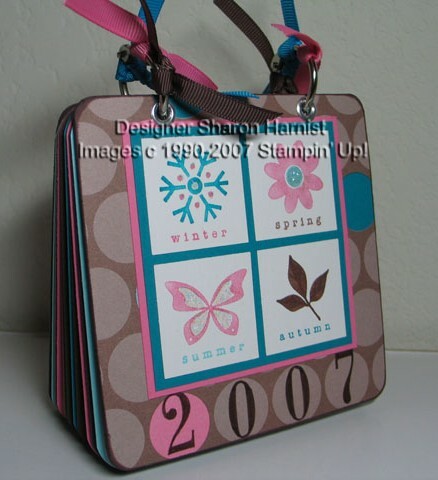 I used Stampin' Up's Perennial Favorites, Typeset Numbers & Riveting stamp sets. Have fun with your imagination and trying this project for almost any ocassion or gift-giving need! C -Cake or Pie: Pie, usually pumpkin! D - Drink of Choice: Coffee, sweet iced tea, good wine & ‘tini’s! E - Essential item you use everyday: Computer and cell phone . . . it's a techno world, isn't it?! F - Favorite Color: Changes with my mood and season but usually blues, greens, pinks, browns . . . always black! G - Gummy Bears or Worms: Haribo Gummy Bears, none of that sour stuff! Q - Fave Quote: "Life is what you make it"
S - Season: Spring when everything is blooming again and getting warm; Fall with cooler temps and beautiful warm colors. U - Unknown fact about me: Hummm, well I guess it's unknown to even me! W - Worst Habit: Throwing things into a pile that I'll "organize later" . . . ugh! Please check back in and bear with me as I make my way thru learning this software and share some delightful paper concoctions with you!